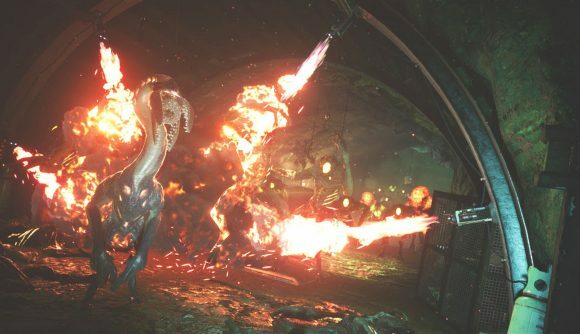 Earthfall’s getting a major update later this month, bringing a horde mode and a progression system to the four-player co-op shooter. The Invasion Update will arrive just ahead of Halloween, and as well as the new features, will include new sound design from the team behind Deadpool 2 and Blade Runner 2049. The Invasion Update will bring two long-requested features to the game. The first of those is Horde Mode, in which you’ll be tasked with fighting back against countless waves of aliens across a collection of four maps being introduced with the new update. The second new feature is player progression. When the update drops, players will be able to work their way up 50 levels, unlocking new cosmetics as well as abilities for their characters. The Earthfall Invasion Update will be available as a free download across PC, Xbox One, and PS4 from October 30. You can check out a new dev diary exploring the update and taking a more in-depth look at the game’s revamped sound design, in the video above.